Creating shows that touch upon serious social and political issues is a common Hollywood practice these days. Sometimes, they become one of those overly politically-involved productions that cause a lot of people to lose interest. However, occasionally the big production companies get it right. One of those true-to-life shows is Netflix’s One Day at a Time. The show follows a Cuban-American single mother, her two teenagers, and their grandmother, who all live together. It is a sitcom, so you’re guaranteed to laugh, but every episode has a message, too. These messages aren’t cheesy “teaching moments,” but instead fluid parts of the story. Viewers can definitely relate to the common issues this show touches, such as depression, anxiety, immigration, and homosexuality. One Day at a Time’s multinational cast allows the show to authentically tackle issues like immigration and racial injustice. It’s a pleasure to watch a show that’s intelligent yet amusing, especially in this century. The production also includes accurately-portrayed characters of a variety of races, which has been a predominant issue in the film industry for many years. If you’re looking for a simple binge watching night in, One Day at a Time is still for you. This show will make you cry both happy and sad tears, thanks to the brilliant writing and performances. Justina Machado and Rita Moreno make a brilliant female lead duo. They also prove that female-centric shows do well and provide quality entertainment, no matter the audience. Additionally, the refreshing ideas presented on One Day at a Time always show multiple sides of the story, which is important these days. It teaches its audience to objectively interpret life and laugh at it! It’s an appealing way to spend your time and become a more understanding human being. 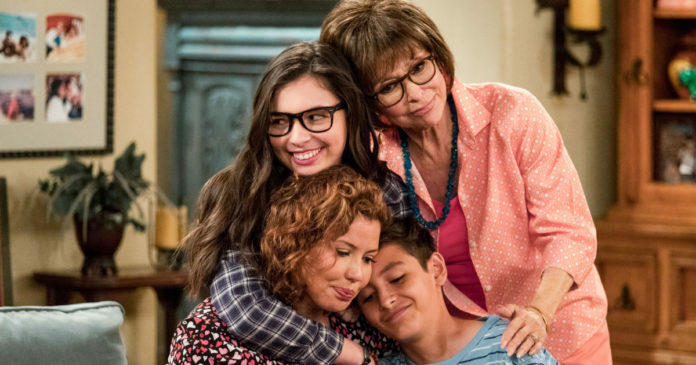 Although Netflix suddenly cancelled One Day at a Time in mid-March, the three seasons available on the streaming platform are more than worth your time. And, who knows? According to an interview with ET, the sitcom’s cast hopes that another network will pick up the series. The truth is, we need more shows like One Day at a Time. I hope – as do many other young audiences – that shows like these become more widespread and normalize taboo issues. We can’t let important shows like these disappear. So, if you’re anything like me, watch One Day at a Time and enjoy the vast variety of emotions you will experience!